French ties: Teacher Sharyn Leafe and Year 3 students with the letters and hamper of Aussie goodies they sent to L’Ecole Victoria students in the French town of Villers-Bretonneux. A SHORT film commemorating events that took place in a small town in northern France 100 years ago is helping forge new friendships between two schools on opposite sides of the world. 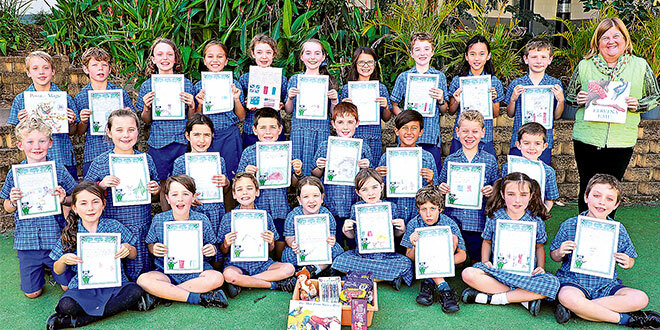 The film “Do Not Forget Australia, the duty of remembrance in Villers-Bretonneux” inspired Year 3 students at St Luke’s School, Capalaba, to put pen to paper and write to students at L’Ecole Victoria (Victoria School) who made the film. On April 24-25, 1918, Villers-Bretonneux village was the scene of the world’s first tank battle between British and German troops. The Germans won and occupied the township only to then face two Australian brigades in a counter attack. By the end of the battle, there were 2400 Australian casualties with the decisive battle marking the end of the German advance in the Somme. In the centenary year of the battle the students’ short film won the Sadlier-Stokes award and featured at the official opening of the Sir John Monash Interpretive Centre, a museum that commemorates Australian servicemen and women who served on the Western Front during the First World War. In 2017, St Luke’s teacher Sharyn Leafe visited the school in Villers-Bretonneux and established a connection with the teacher there. “On my visit I left a few gifts from St Luke’s and my email address,” Mrs Leafe said. She said the French teacher emailed classroom photos to her with his students holding up books, including The Two Pennies. “They were the same books we were reading here at St Luke’s – only in French,” she said. Mrs Leafe said her students wrote their letters in French hoping to start some new friendships with the children at L’Ecole Victoria. “They want to tell them who they are, how old they are, what they liked to eat and what they liked to do in their spare time,” she said. Mrs Leafe said they also put together a small hamper of Australian goodies for their French counterparts to enjoy. “Each student brought in one item they felt represented Australia,” she said. Mrs Leafe said the French teacher told her his students were awaiting this parcel. “They have no idea what’s in the parcel only that it’s coming,” she said. Student Samantha Hinds said it was cool to be able to send messages to other children in a far-off country. “It’s great that we get to have these pen pals and show them how we live in Australia,” Samantha said. “I’m really hoping one of them writes back to me. Samantha said it was amazing to think that one day she might be able to meet the person who wrote back to her. Mrs Leafe said another positive outcome from the history project was her students began discovering their own family histories. “When they started talking to their own families they had no idea about their stories of the war,” she said. “They are hearing stories from their grandparents and great-grandparents asking them all sorts of questions like do they remember hearing the air-raid siren or going without eggs or sugar.